Making your own chili powder is easy and allows you to get just the right flavor and degree of heat or spice that you want! 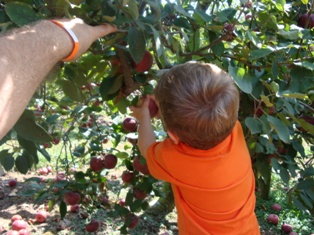 You can start from scratch, by drying the raw ingredients yourself, or start with each already dried and blend them. Either way, I'll explain how below. 3 ancho chili peppers, stemmed, seeded and sliced. 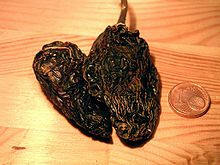 Ancho chili's are the dried form of the poblano pepper. The poblano (shown at right) is a mild chili pepper from Puebla, Mexico. 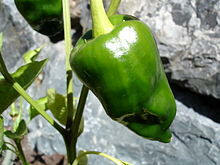 The ripened red poblano is much hotter and more flavorful than the less ripe, green poblano. There is great variation in hotness among this pepper. Different peppers from the same plant have been reported to vary substantially in heat intensity. If you can't get poblano or try a closely related variety, the mulato, which is darker in color, sweeter in flavor and softer in texture. 3 cascabel chiles, stemmed, seeded and sliced - The cascabel chili (little bell), shown at right, also known as the rattle chili, is another Mexican pepper, whose loose seeds rattle inside the dried cascabel when shaken. 1 tablespoon of dried coriander seeds - These should be readily available in their dried form wherever herbs are sold. Or you can grow your own Cilantro. Coriander is the seeds from Cilantro! 3 dried arbol chiles, stemmed, seeded and sliced - The Chile de árbol (also called bird's beak chile and rat's tail chile) is a small and potent Mexican chili pepper about 2 to 3 inches (5.1 to 7.6 cm) long, and 1⁄4 to 3⁄8 inch (0.64 to 0.95 cm) in diameter. Their heat index is between 15,000 and 30,000 Scoville units. If you cannot find árbol chili peppers, you can use Cayenne pepper (30-50,000 Scoville units) or Pequin pepper (100-140,000 Scoville units). As with all hot peppers, be careful not to touch your eyes, nose or other sensitive skin after handling this pepper; and wash hands thoroughly after handling the pepper or its seeds. 2 tablespoons whole cumin seeds - These should be readily available in their dried form wherever herbs are sold. Shown at right. 2 tablespoons garlic powder - Again, readily available in their dried form wherever herbs are sold, but if you grow garlic, you can dry it, too. 1 tablespoon dried oregano - Easy to grow and easy to dry. 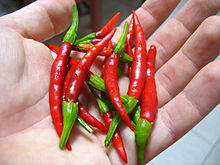 1 teaspoon Chipotle pepper - Chipotles are smoked dried jalapeño pepper. You're probably better off buying them smoked and dried than trying to msoke-dry your own, if you really want to capture that smokey flavor. If you want a milder flavor, remove stems and seeds from all the chiles. Put the chiles in a single layer on a baking sheet and bake for 4 or 5 minutes. Remove the pan and check the chiles (they cool almost immediately). The smaller chiles will be toasted first, so remove them and set aside. Bake the larger pieces another 4 minutes and check again. The poblanos will be done last, but as portions of them toast, break them off and set aside returning the pan to the oven if necessary. Put all of the dried chiles and the cumin into a medium cast iron or nonstick saute pan over medium-high heat. Cook, moving the pan constantly, until you begin to smell the cumin toasting. This should take about 4 or 5 minutes. Set them aside to cool completely. Once cool, place the chiles, coriander and cumin into your blender along with the garlic powder, oregano. Process until they turn into a powder. Be sure to wait a few minutes to let the dust to settle, then pour into an airtight container to store for up to 6 months. Storing in the freezer helps to lengthen the storage time of the flavor.